Feb 10th, 2016 was the 5th anniversary of the passing of my sassy and sneaky but sweet old dog, Sable, so I thought I’d share a few fun photos in her memory. 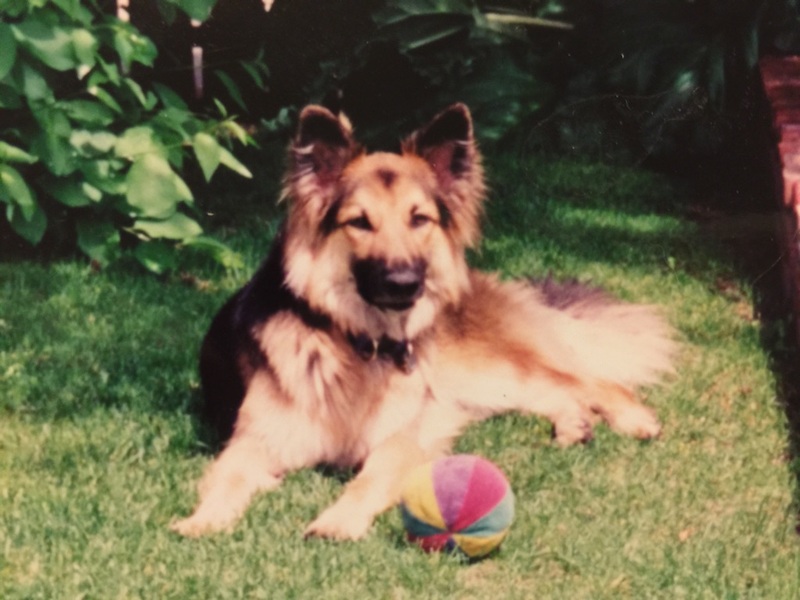 Although having to say goodbye to a beloved pet is terribly painful 🙁 I have found that with time, the initial hurt associated with missing them gradually shifts to fond remembrance…thank goodness! 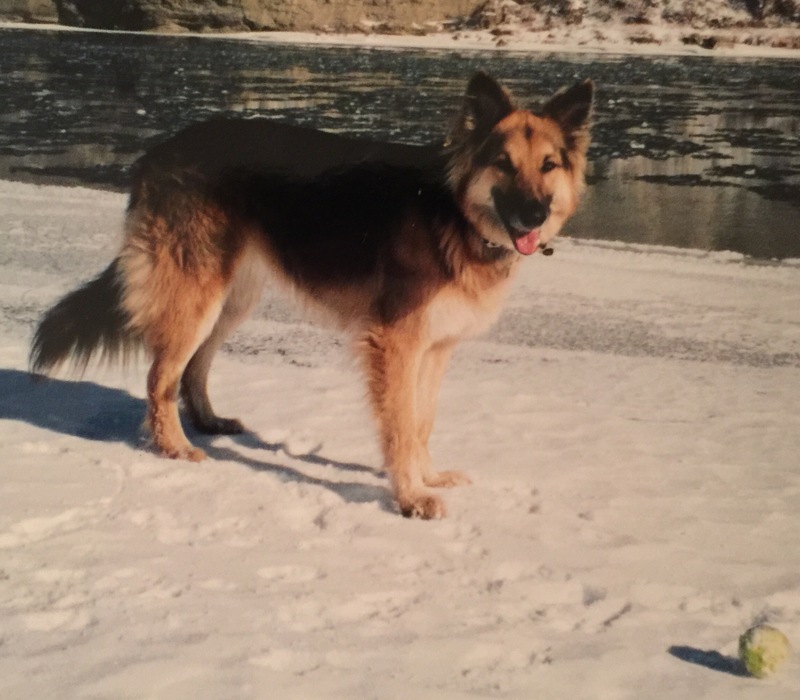 Sable was a long-haired German Shepherd with possibly a smidgen of Border Collie thrown in. She certainly had the speed, agility and herding-ability of a Border Collie – but her beautiful markings, Super Model appearance (and Diva attitude) and protective nature were definitely Shepherd. 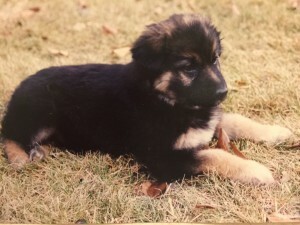 John and I first got Sable as a 7 week old puppy. One of his buddies gave her to us as a late wedding gift. And let’s just say it was a darn good thing she was cute because she was so naughty for the first 9 months of her life, I swear I will never be a puppy-parent again. She would grab on to the side of my sweat pants, just for fun, and refuse to let go as I tried to walk around the house. And she chewed – or ate – everything in sight. The minute John told her to do something, she would immediately do it. Me, not so much. 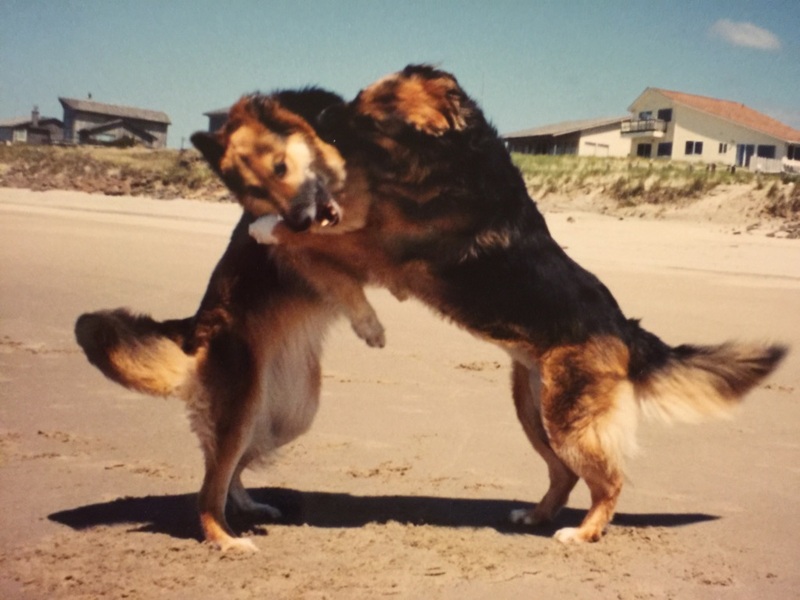 In her obedience classes, she was far too busy trying to play with other dogs to pay attention to what we were trying to teach her. But come graduation night, she managed – to the dismay of the instructor and other dog owners – to get top honours in her class. John passed away when Sable was 3. In fact, his funeral was on Sable’s 3rd birthday and when I came home from his funeral, I found a special surprise for Sable in my fridge: a cake made out of hamburger and covered with cream cheese frosting with three candles sticking out the top. A kind neighbour had made it, in the hopes of putting a smile on my face on such a horribly sad day. I don’t know that I smiled – but Sable sure did when she got to eat it. Eventually, of course, I did begin to smile again. 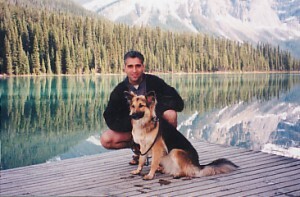 But looking back now, I’m not sure how I would have managed after John’s death if I didn’t have Sable to care for. Because of her, I had to get out of bed each day. And I had to get out into nature and go for long walks…which is, of course, extremely therapeutic in and of itself. Six months after John’s death, Soda – Sable’s partner in crime – came along. My friend, Nora, figured Soda, who was a year at the time and needed a home, would be a good addition to our little pack…and was she ever right. For the next decade, Sable, Soda and I had a heck of a lot of fun together! A few months before Sable passed away, my friend, Terri, and I took her and Soda on a big road trip from Victoria all the way to San Simeon (south of San Francisco) and back. 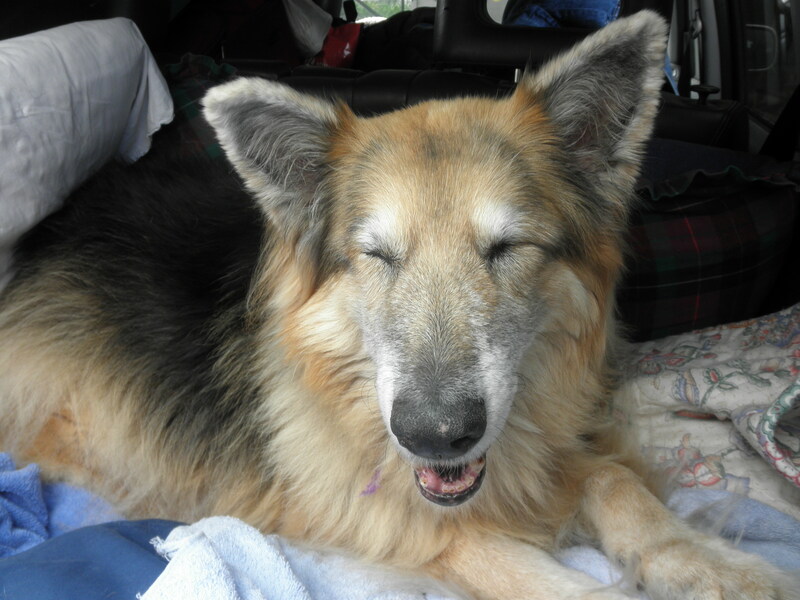 Sable, ever the Diva (even though both eyes had been removed by that point, due to glaucoma), rode the entire trip in her palatial suite at the back of the car – while the rest of us were squished in around the luggage. I remember the day when it became clear that Sable’s time was up and I had to take her to the vet to be put down at the age of 13. Though devastated – afterwards, I called my Mom from the Tim Horton’s parking lot, sobbing – I also felt a tremendous sense of accomplishment at having successfully cared for and loved a dog her entire life. It almost felt as if I had fulfilled some sort of…contract in which I had been given a precious, albeit feisty, puppy and my job had been to give her a good, long life with lots of walks, yummy food (much of it stolen from unimpressed family members) proper healthcare and oodles of love. Wow. I can’t believe it has been 5 years already! Thanks for sharing such great photos and fond memories of Sable. A dog’s unconditional love is the best! Love this story Maryanne! 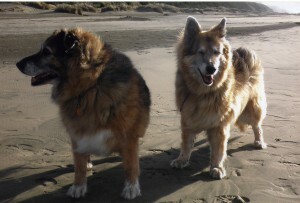 We too had a German Shepherd/Border Collie mix dog for over 15 years. Rosie was our son John’s dog. When he died she also grieved for her master and we certainly had a difficult time putting her down several years later. 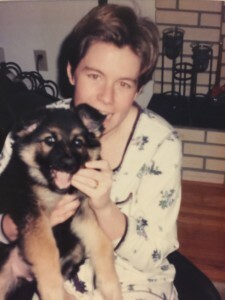 She was our last physical connection to our son whose 36th birthday is tomorrow February 11th. I remember reading about Rosie! And I remember thinking that Rosie sounded an awful lot like our Sable. Big hug to you today, Marjorie, in honour of your John’s 36th birthday. 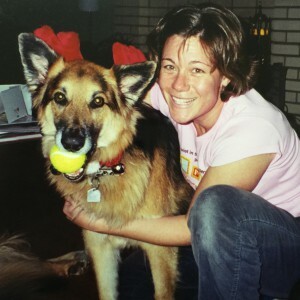 Thanks, Wende…you know all about having to say good-bye to a beloved old canine companion. Roo was awesome!